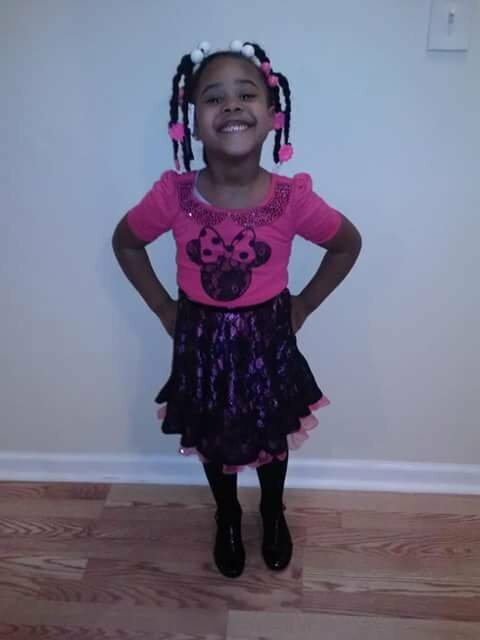 Gabby Hill Carter, 8, was killed by a stray bullet as she played outside in her neighborhood. 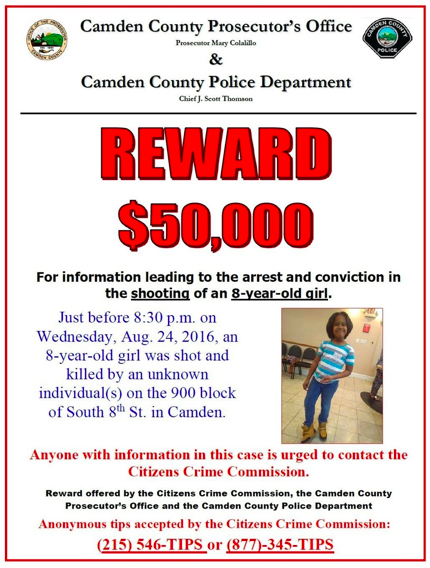 Update, Aug. 29, 2016: The reward for information leading to the arrest and conviction of the person responsible for killing Gabby Hill Carter, an eight-year-old Camden girl, was increased to $70,000 on Monday. Not long after that announcement, the reward was bumped up again. It now stands at $76,000. On Saturday, the 900 block of South 8th Street in the Bergen Square section of Camden was full of sadness, fear – and cops. Lots and lots of cops. Patrol cars boxed in the neighborhood, their overheads alternating between red and blue, residents looking over their shoulders. 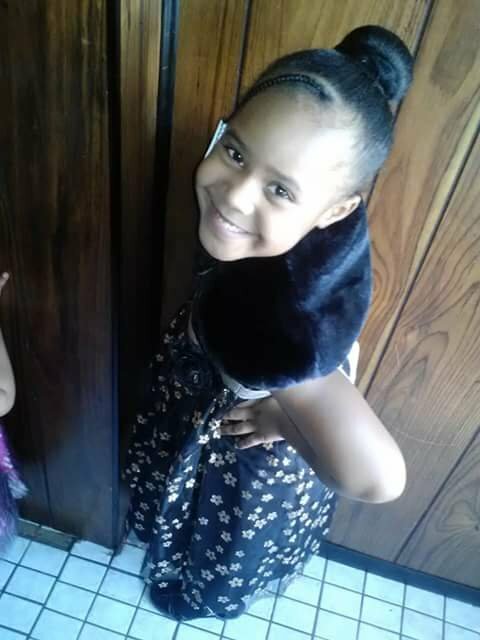 Gabby Hill Carter, who was just 8, was shot in the head by a stray bullet Wednesday at about 8:30 p.m. She was at play on the sidewalk outside her home. About 20 yards away from where she was struck, a police mobile command center sat Saturday, a silent witness to the sadness and fear filling the neighborhood. A reward leading to arrests – at first $5,000, jacked up to $12,000, and raised to $24,000 Saturday afternoon – remains unclaimed. The amount was more than doubled on Sunday with a $26,000 donation from the Norcross family, raising the total reward to $50,000. 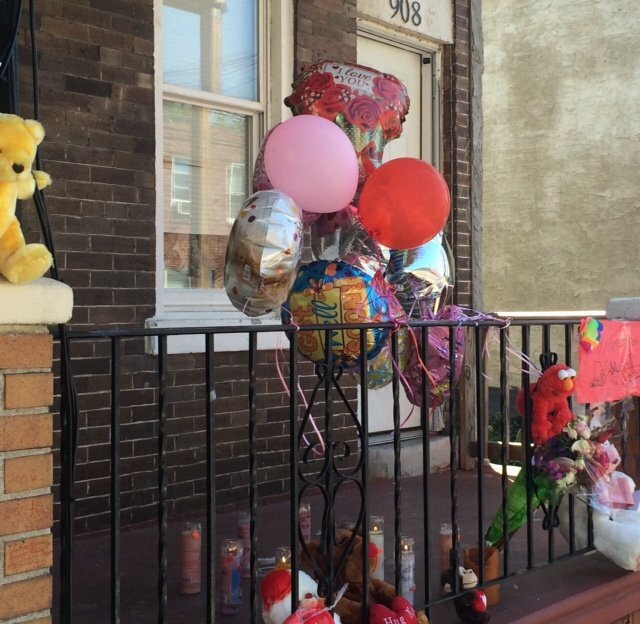 A memorial to the tiny victim of Camden’s tendency for violence and gunplay intertwined with the drug trade sits on the front porch of Gabby’s home, the site of a memorial vigil. Balloons writhed in the wind, struggling to break free. Candles flickered, some snuffed out. A poster on the porch of Gabby Carter. The child was shot in the head as she played outside. Gabby Hill Carter was shot in the head Wednesday evening and died Friday. 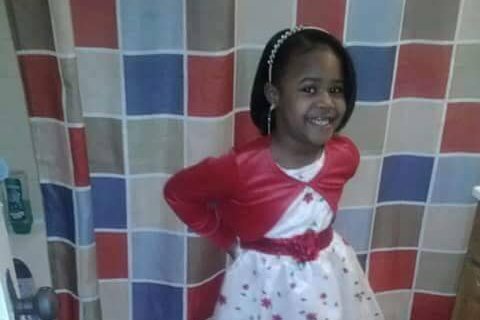 The eight-year-old was playing outside in her Camden neighborhood when a stray bullet struck her. A woman visiting her boyfriend Saturday morning walked by the dead girl’s home with purpose, tightly holding her own young daughter’s hand, trying to assure a sense of safety and security drained away from the neighborhood when Gabby was struck by a bullet. 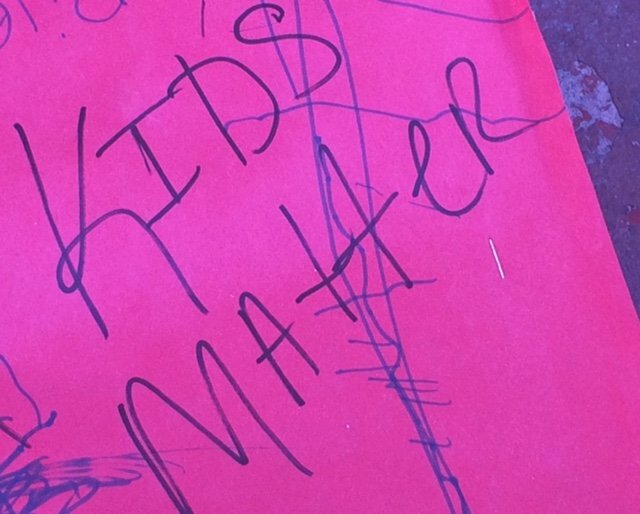 “This is a dangerous neighborhood," the mother explained. "I don’t let her play outside." Gabby had clung to life until Friday. But even the highly-skilled medical personnel at Cooper University Hospital’s Level One Trauma Center could not reverse the damage done by a bullet speeding toward Gabby at more than 800 feet per second. Neighbors have said the shooting was drug-related, a dispute between gangs. Apparently, several men were stalking another man when Gabby was hit by an errant bullet. Gabby Hill Carter was shot in the head and later died. She was playing outside in her Camden neighborhood when a stray bullet struck her. Authorities are seeking four men. 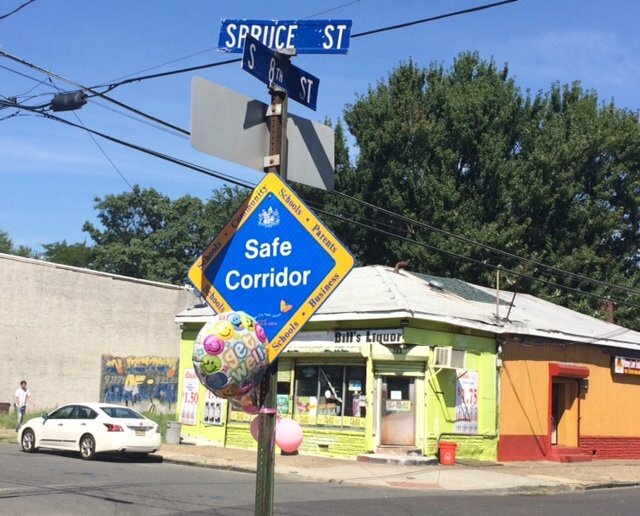 Ironically, the little girl lost her life on a “safe corridor” street, meant as a safety zone for children walking to school in Camden. Gabby was about to begin third grade at Camden Community Charter School when she was shot to death. A man buying beer at a nearby liquor store, who said he didn’t want to give his name because he is a city employee, complained the Camden County Police Department had not kept drug dealers out of the Bergen Square neighborhood after pushing them away more than a year ago. “But I hope they find the killers of that little girl,” he said. Business at Bill’s Liquor was way down in the wake of the shooting, despite the heavy police presence. The store’s owner said the neighborhood is prone to violence, but this was the closest murder to his store in his 30 years in business. Anyone with information is asked to call Prosecutor's Det. Sherman Hopkins at (856) 225-8623 or Camden County Police Department Det. Michael Ross at (856) 757-7420. To assist with funeral expenses, donations can be made at "Home Going for Gabby," a GoFundMe page set up by her uncle, Michael Carter. Authorities said Vahan and Danielle Gureghian, whose CSMI, LLC manages the Camden Community Charter School, have offered to cover the funeral costs. The $50,000 reward is offered by the Citizens Crime Commission, the Camden County Prosecutor’s Office and the Camden County Police Department. FULL DISCLOSURE: PhillyVoice.com Executive Director Lexie Norcross is the daughter of George E. Norcross III and niece of Congressman Donald W. Norcross, who committed an additional $26,000 to the reward offered in the investigation of Gabrielle Hill-Carter's death.